Figure (s) an improvised investigation of the “animacy of sculpture” (a phrase borrowed from artist Liane Lang). I endeavour to allow all the objects in the piece, including the live body/s, to become themselves, in other words, to act in accordance with their physical properties. The outcome of each improvised investigation is a unique composition of movement, object and sound. 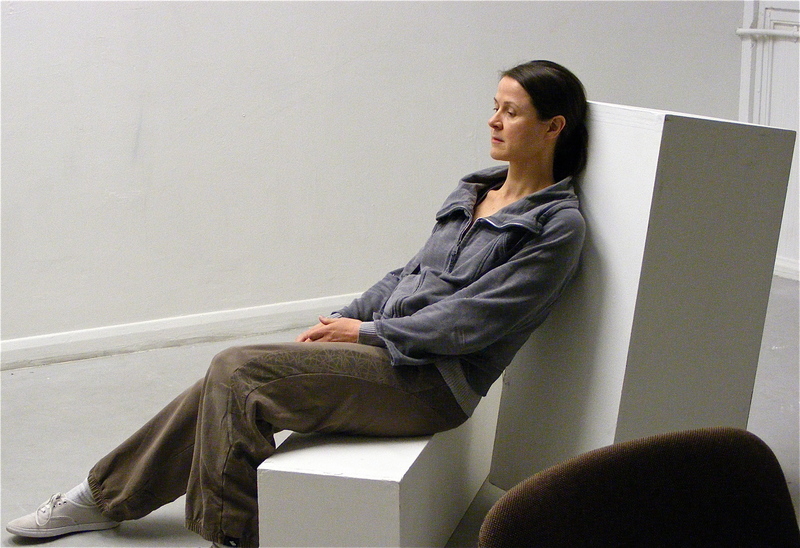 Researched over the course of a year with artist and musician Jennie Howell, Figure(s) has developed into a solo performance for one performer, plinths and acoustic objects. Performed at the University of Brighton on 5 November 2013 and 7 January 2014, and at the Body Performance Festival on 29 March 2014 at Bath Artists Studios. At one and the same time sculptor and sculpture, the performer of Figure (s) makes use of post-modern dance processes including tasks to generate movement and sound material. The performance becomes an animated landscape and is informed by an approach to sound-making similar to foley. A pre-cursor to my current explorations of the live and the media-ted body in performance, the setting or objects begin to enter the work and become as important as the activity within it. The task-based interaction with the objects arrives at a composition which alludes to themes of both landscape and time.